Origami for the outback. With only one trekking pole, the Wingtarp SUL 2P can be turned into an emergency tent for up to two people. The intelligent design allows various setups. For example, the wings can be folded and used as floor. If the tarp is completely stretched out, it offers generous space. In addition, it can be used as awning or coupled to almost all Vaude tents to extend the vestibule. 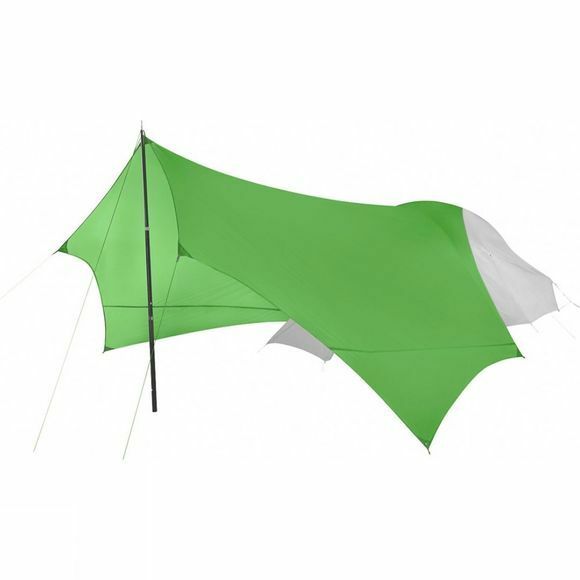 A universal connector allows simple set up and take down, and you can, combines several tarps together to make a grand sun shade. To protect the environment, the flysheet was made with resource-efficient and environment-friendly manufacturing in accordance with the Bluesign standard.